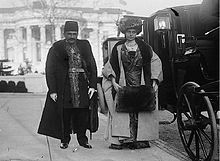 Persia's Chargé d'affaires and his wife visiting President Woodrow Wilson at the White House by invitation. A chargé d'affaires (French pronunciation: ​[ʃaʁʒe dafɛʁ]), often shortened to chargé (French) and sometimes to charge-D (abbreviated in colloquial English), is a diplomat who heads an embassy in the absence of the ambassador. The term is French for "charged with (in charge of) matters". A female diplomat may be designated a chargée d'affaires, following French declension. A chargé enjoys the same privileges and immunities as a regular ambassador. However, chargés d'affaires are outranked by ambassadors and have lower precedence at formal diplomatic events. In most cases, a diplomat would only serve as a chargé d'affaires on a temporary basis in the absence of the ambassador. In unusual situations, a chargé d'affaires may be appointed for an indefinite period, in cases where disputes between the two countries make it impossible or undesirable to send agents of a higher diplomatic rank. An invitation from the Japanese chargé d'affaires in Iceland. Chargés d'affaires ad interim ("a.i.") are those who temporarily head a diplomatic mission in the absence of the accredited head of that mission. It is usual to appoint a counsellor or secretary of delegation to be chargé d'affaires ad interim, and he is presented to the foreign minister of the receiving state by the former head of mission before he leaves his post. Chargés d'affaires ad interim are not themselves deemed to be formally accredited, as they do not possess diplomatic credentials. Chargés d'affaires en pied ("e.p.") are appointed to be permanent heads of mission, in cases where the two countries lack ambassadorial-level relations. They are appointed by letters of credence from the foreign minister of the sending state to the foreign minister of the receiving state. Chargés d'affaires en pied have precedence over chargés d'affaires ad interim, but are outranked by ambassadors. They are sometimes referred to as chargés d'affaires ad hoc or en titre. In certain cases, a chargé d'affaires may be appointed for long periods, such as when a mission is headed by a non-resident ambassador who is accredited to multiple countries. In addition, a mission may be downgraded from an ambassadorial to a chargé d'affaires level to show displeasure, yet avoid taking the extremely serious step of breaking diplomatic relations. For example, Saudi Arabia and Thailand have not exchanged ambassadors since 1989, due to the still-unresolved Blue Diamond Affair. When diplomatic recognition is extended to a new government, a chargé will be sent to immediately establish diplomatic representation. However, if a timely exchange of ambassadors does not take place, this may result in a prolonged period of chargé-level relations. For example, the United Kingdom recognized the People's Republic of China in 1950 and posted a chargé d'affaires in the new capital of Beijing. However, China was unwilling to exchange ambassadors until the United Kingdom withdrew its consulate from Taipei. Sino-British relations were not upgraded to the ambassadorial level until 1972. Since a chargé d'affaires presents his or her credentials to the foreign minister rather than the head of state, the appointment of a chargé may avoid a politically sensitive meeting that would imply approval or recognition of that head of state or government. Similarly, the receiving country may decline to receive an ambassador, but still maintain diplomatic relations by accepting a chargé. For example, the Republic of Cyprus appoints a number of chargés d'affaires en pied to its embassies abroad. In modern use, chargés d'affaires do not essentially differ from ambassadors, envoys or ministers resident. They represent their nation, and apart from rank and precedence, enjoy the same privileges and immunities as other diplomatic agents. However, there have been rare historical circumstances in which a diplomatic post, formally ranking as chargé d'affaires, was in fact employed in a more significant colonial role, as commonly held by a resident. Thus, in Annam-Tonkin (most of present Vietnam), the first French chargé d'affaires at Huế, the local ruler's capital, since 1875; one of them (three terms) was appointed the first resident-general on 11 June 1884, as they stopped being tributary to the Chinese Empire, less than a year after the 25 August 1883 French protectorates over Annam and Tonkin (central and northern regions). In French usage, chargé d'affaires may be used outside diplomacy either as a specific position, or in general terms to indicate an individual with some more or less temporary responsibility for a specific area of activity. Chargé d'affaires generally follows French usage: chargé d'affaires is singular, chargés d'affaires for plural. The "d'affaires" is always in the plural form, and should be lowercase even if Chargé is capitalized. Following the French declension, chargée d'affaires (with the feminine ending) may be seen where the chargé is female. For temporary chargés, ad interim may or may not be added depending on the context, but is always lower case; it may be italicized or shortened to simply a.i. ^ a b "2 FAM 320 Precedence" (PDF). U.S. Department of State Foreign Affairs Manual. October 18, 2011. Archived from the original (PDF) on 2015-10-10. Retrieved 20 March 2016. ^ a b Boczek, Boleslaw Adam (2005). International Law: A Dictionary. Scarecrow Press. p. 48. ISBN 978-0810850781. ^ "U.S. Relations With Venezuela". Burean of Western Hemisphere Affairs, U.S. Department of State. July 20, 2015. Archived from the original on March 15, 2016. There currently is no U.S. Ambassador to Venezuela; the U.S. Charge d'Affaires en pied is Lee McClenny. ^ Denza, Eileen (2016). Diplomatic Law: Commentary on the Vienna Convention on Diplomatic Relations. Oxford University Press. p. 99. ISBN 9780198703969. Chargés d'affaires ad interim are distinct from the 'chargés d'affaires accredited to Ministers for Foreign Affairs' who are listed under Article 14 of the Convention as forming the third class of heads of mission. The latter are often described as 'chargés d'affairs en pied ', and can be traced back to the eighteenth century 'agents'. ^ Freeman, Jr., Charles W. (1993). Diplomat's dictionary. Washington, DC: National Defense University Press. p. 56. ISBN 9780788125669. Chargé d'Affaires: An officer in charge of an embassy who is not an ambassador, e.g., when the level of relations between two states has been lowered to below the ambassadorial level, and accredited to the Minister of Foreign Affairs, rather than to the chief of state. In such circumstances, termed Chargé d'Affaires ad hoc. ^ "Embassy issues another angry statement". nationmultimedia.com. Archived from the original on 2010-09-22. Retrieved 2013-03-12. Mr. Nabil Ashri said that "The Kingdom of Saudi Arabia's goal on this issue stems directly from its firm and clear foreign policy of non-interference, and seeking closer cooperation and developing friendly international relations, as its relations with the Kingdom of Thailand suffered because of the appalling unsolved crimes currently pending and which have resulted in the downgrading of bilateral relations affecting both the people of Saudi Arabia and Thailand for more than 20 years", adding "it is my duty to try to negotiate this issue with the Thai Government, in order to avoid any further tension or undesirable complications in bilateral relations". ^ "China (Exchange of Ambassadors)". Parliamentary Debates (Hansard). House of Commons. 13 March 1972. col. 31–35. When early last year we decided to resume discussions with the Chinese Government on this subject we told them that if an agreement on an exchange of ambassadors was reached we would be prepared to withdraw our consulate from Taiwan. This we shall now do. ^ "Cyprus Diplomatic Missions Abroad". Archived from the original on 25 April 2016. Retrieved 19 May 2013. This article incorporates text from a publication now in the public domain: Chisholm, Hugh, ed. (1911). "Chargé d'Affaires" . Encyclopædia Britannica. 5 (11th ed.). Cambridge University Press. p. 859.